You’ve come a long way, baby. From my high school days in the early 90’s religiously watching a VHS copy of the no-rules madness that was UFC 2 to the Atlanta debut at UFC 88: Breakthrough to the current generation of world-class martial artists and athletes showcased weekly on ESPN, it is a rare treat to witness the evolution of a sport in real time. On April 13th, the UFC returns to Atlanta for the fourth time on Pay-Per-View at UFC 236: Holloway vs Poirier 2, and this trip to Atlanta will have more buzz then Georgia Tech on rivalry week against UGA. Much has changed since the UFC debut in Atlanta when Chuck Liddell and Rashad Evans battled in the main event. 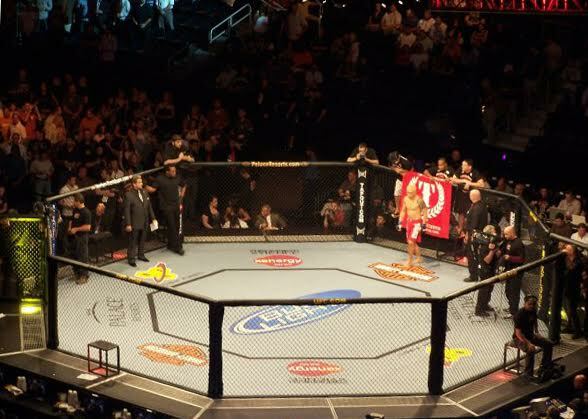 That was my first live UFC event, and I still remember how shockingly silent Phillips Arena went as Rashad Evans viciously separated Chuck Liddell from his consciousness in the middle of the octagon. Back then, number one contenders actually fought for titles, jumping weight classes was reserved for only the most elite champions, and interim titles were the rare exception (there had only been 4 interim title fights prior to UFC 88). It was long before fighters like Jon Jones and Conor McGregor had mainstream appeal. As the UFC has grown and evolved, it feels like there are more questions about the promotion than answers. The days of mixed martial arts being pure and simple are a distant memory compared to the current chaos of “unified” rules, money fights, referee judgment calls, instant replay, and a new interim title given out or taken away seemingly every few months. UFC 236: Holloway vs Poirier 2 highlights this chaos being the first UFC event with multiple interim titles. The main event features current UFC Featherweight Champion Max Holloway moving up to lightweight to take on Dustin Poirier for the Interim Lightweight Championship in a rematch of their 2012 fight at UFC 143. Current UFC Lightweight Champion, Khabib Nurmagomedov is suspended by the Nevada State Athletic Commission along with a couple of training partners for their roles in the UFC 229 post-fight melee. Nurmagomedov is on record by saying he will not compete again until all are reinstated and will never fight in Las Vegas again as a result of their punishment. With Khabib not willing to compete for at least a year following the defeat of Conor McGregor in his first title defense, the UFC decided that Holloway and Poirier would fill this void. While the world waits for the fifth attempt at a Khabib vs Ferguson matchup, we have two new names to the lightweight title party. Max Holloway is on an even more impressive 13-fight win streak, most recently defending his 145lb title against previously undefeated Brian Ortega. Holloway will once again step into the octagon opposite Dustin Poirier who, in his most recent fight, dispatched former lightweight champion Eddie Alvarez with a brutal 2nd round stoppage. While this matchup is explosive on paper, the real fireworks begin after April 13th. The winner SHOULD be in line to fight Nurmagomedov to unify the lightweight titles. Whether Khabib is interested in returning to the octagon then remains to be seen. If Holloway leaves Atlanta with the victory, the UFC will have even more muddy waters to deal with in the featherweight division. That being said, you still have Tony Ferguson, Conor McGregor, and previous interim title contender Al Iaquinta all currently without opponents and all top-ranked lightweights. Is your head done spinning yet? Things aren’t much better at middleweight where the co-main event is an interim title fight between The Ultimate Fighter 17 Winner, Kevin Gastelum, and undefeated mega-star-in-the-making Israel Adesanya. How exactly did we get to this interim title fight? Its almost as crazy as the path to the main event, so here goes. Robert Whittaker is the reigning Middleweight Champion while never actually fighting for the undisputed middleweight title. Wait, what? Yes, that’s right. Robert Whittaker won the INTERIM Middleweight Title by defeating Yoel Romero in their first fight at UFC 213. That matchup was a result of injuries to then Middleweight Champion Michael Bisping. When Bisping returned from injury to defend his title, it was against George St-Pierre, not Robert Whittaker. GSP won that fight becoming the UFC’s 4th multi-division champion. St-Pierre never defended that title, and Robert Whittaker’s interim belt was promoted to the undisputed title without facing another challenger. Whittaker’s first title defense as the undisputed champion was set for a rematch with Romero, but with Yoel missing weight, that contest ended up being a non-title fight. With Robert Whittaker solidified as the king of the 185-lb division, his first official title defense was set against Kevin Gastelum at UFC 234 this past February 10th in front of a home crowd in Melbourne, Australia. Just hours before the event, Robert Whittaker suffered a hernia and collapsed bowel and was forced to undergo emergency surgery. The fight was off and Kevin Gastelum went from main-event participant to spectator before he knew it. The co-main event matchup of Israel Adesanya vs Anderson Silva was promoted to the main event of UFC 234, and in the week leading up to the event, Dana White gave his blessing for that winner to be the next middleweight title contender. With Gastelum eager to return quickly, Adesanya looks to fast track his title hopes ahead of schedule. This stylistic matchup is very intriguing. Adesanya is clearly the superior striker with a dynamic range of standup skills. He has yet to taste defeat as a professional mixed martial artist and has finished 13 of his 16 opponents. Gastelum’s strategy will likely be to pressure Adesanya and get the fight to the ground where he should have a grappling and strength advantage. Doing so against a very quick and rangy striker like Adesanya could prove to be a difficult challenge for Gastelum who has struggled in the past with similar standup fighters. Unlike the main event which could affect multiple weight classes, this matchup should start to clear up a confusing few years of middleweight uncertainty. Its new chapter for the UFC joining ESPN to start 2019, and the exposure and growth of the sport seems limitless today. While the rest of this card is being finalized, Atlanta is set to welcome back the UFC with open arms. Although these fights are still a few weeks away, nothing is set with these fights until you see both men in the octagon with the cage door locked. Just ask Kevin Gastelum. Find more events in Atlanta by registering on 404area, your free guide to everything in your city!